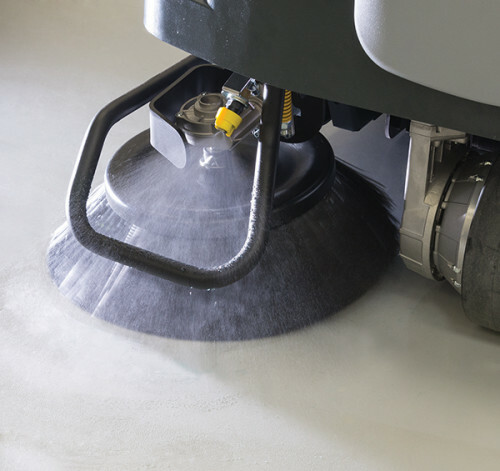 The SW5500 is a highly maneuverable industrial floor sweeper with superior dust control. 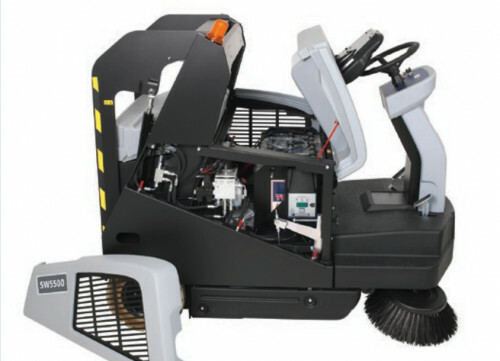 This sweeper utilizes an over-throw sweeping method that allows for efficient collection of debris and intuitive front wheel steering. With a 60 inch sweeping path and a 40 gallon hopper, this compact sweeper is designed to be very productive. Safety is a key component to great equipment design. The SW5500 utilizes a ClearView™ design that provides the operator with a clear line of sight to both side brooms while comfortable seated. This reduces the chance of damage resulting from an impact while edge sweeping. The SW5500 also automatically reduces the speed of the sweeper when it enters a turn which allows for safer handling of the equipment. The hopper raise/lower functionality also requires the use of both hands on control buttons to ensure that the operator is away from any pinch hazards. The SW5500 hopper can be raised to a height of 65", making it easy to dump debris directly into a waste receptacle while the operator remains seated. The hopper assembly can hold 40 gallons of debris and lift up to 530 lbs of collected debris. Since the SW5500 uses an over-throw sweeping method, you get full utilization of the entire hopper capacity. 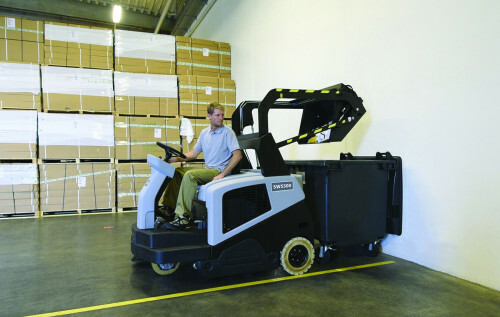 The SW5500 operator controls are very easy to use and require minimal training. 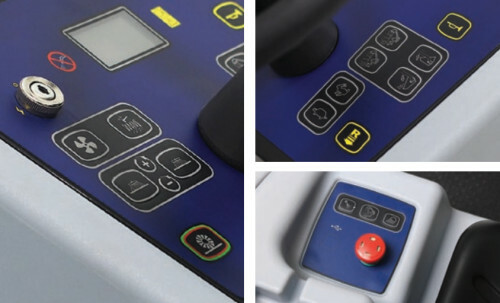 All buttons have icons that are very intuitive and the controls are placed in ergonomic locations.